It is the simple things of life that make living worthwhile, the sweet fundamental things such as love and duty, work and rest, and living close to nature. The story of Gina Savage and Mike Perkins is more than just a tale of dreams coming true. Before the couple met just a few years ago, independent of the other, they each longed to commune with nature, grow food and live more closely to the land. Mike was somewhat nomadic, living in his camper with his dog, traveling and surfing, and growing food wherever he landed. Gina had a traditional job with a design firm, grinding out her days at a desk, longing for a return to her cowgirl roots. It wasn’t though until they met that their mutual dream of running their own farm bloomed into reality in Southern Oregon. The Surf Ranch is a miraculous place, the beneficiary of one of southern Oregon’s lusher microclimates. It contains a cozy stream (the charmingly named “Little Applegate”), a simple yet well-appointed home, and a surrounding acreage able to support a small farm run, basically, by Mike & Gina. We stayed with them in mid-August, during the annual dry season and rampage of western wildfires. And, yet, their property seemed distant from these troubles. Lush grasses, trees and a bounty of fruits and vegetables surround the cool home (incredibly, the house stays cool in 90+ degree heat). And, as guests at their Airbnb, you are treated to all manner of thoughtfulness, attention to detail, and local creature comforts from a batch of freshly plucked tomatoes to the neighboring bakery’s scrumptious bread. 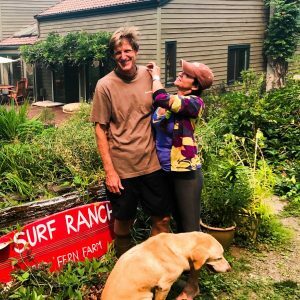 But, the story of Mike and Gina is not entirely about this idyllic picture – made nearly perfect by their amazing ability to host (causing them to become aptly named “superhosts” on Airbnb) and steward their land. 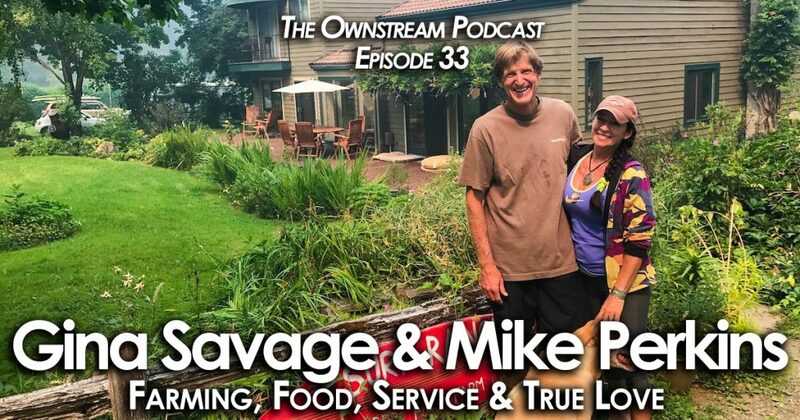 We initially thought that our conversation with them would be exclusively about how they made their farming dreams come true, how they found their land, what it means to commune with nature on a daily basis while most of us live in a world blitzed with technology, why they left their former unsatisfying lives behind and how they inspire epic reviews on Airbnb. We did cover each of these items, which we hope you will enjoy. But, what we found when we spoke with them on their porch, under a moonlit night, and their two dogs asleep by their side, was, in fact, a story of true love. Each question we asked seemed to come back to…love. Their love of the land, of fresh food, of nature and, mostly, their love for each other. It is this union that has given rise to this abundant vision. And, it was love that we profoundly felt from them, and carried with us as we reluctantly left their cozy world in our van, bound for more of our own adventure. Along our western van trip we intended to connect with and interview various mavericks and individuals challenging the status quo. Imagine our surprise then when we stumbled into a timeless romance, expressed in all manner of magnificence within a simple, Oregon farm. This episode is also our first done in person with our guests, as we quietly chatted passing the microphone back and forth at the table. We hope you will then indulge our brief moments of pause amidst our talk. If anything, try to feel into the vision of simplicity and innocence cultivated by these two wonderful people. Within these moments of quiet and reflection, along with their moving words about chasing your dreams and the power of a true partnership, we felt two lives being lived deliberately, deeply and of service to their land, community and each other.